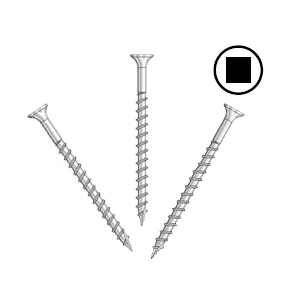 PRODUCT: #9 x 1-1/4 Stainless Steel Wood Deck Screw. Flat Head, #2 Square Drive, Sharp Point. 100/Bag. Price/Bag. OUTDOOR WOOD / DECKING, ACQ LUMBER. ATTACHMENT OF CEMENT AND FIBER CEMENT BOARD TO STEEL OR WOOD.